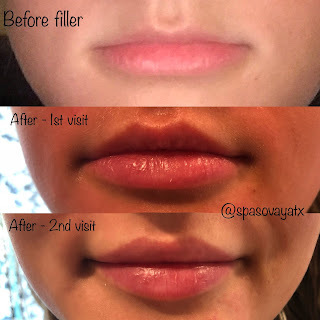 Best Lip Filler Austin Texas! A wonderful example of multiple visits, multiple syringes, and patience resulting in a perfect, total lip transformation! This patient is over 50 years old and has never tried lip filler before due to fear. I came up with a very conservative strategy beginning with JUVEDERM Volbella, 1 syringe, to begin her lip hydration journey. We will revisit in approximately 3 months to discuss whether or not she desires additional finesse work...piece of cake and no fear! My patient desired very natural lip enhancement. It was also important to her to address the vertical lines appearing around the upper and lower lips. I used 1 syringe (1 ml) of Juvederm Volbella. I applied this to her top and bottom vermillion border, left and right oral commissure, and a small amount to her top and bottom lip body. This was the first time she had her lips injected and she was extremely nervous. I assured her Juvederm Volbella was a natural looking filler and a great start. We are open to using more filler after 3 - 6 months if she desires. We are both happy with these results and she’s no longer nervous about filler. Sovay Reeder, Medical Injector. professionalprimp.com. My patient was requesting an increase in lip volume while correcting upper and lower lip asymmetry. She had previous scar tissue to one side of her lower lip and she had less lip volume on one side of her upper lip. We addressed these needs while keeping her lips looking very natural and simply more hydrated and youthful. I added a slight amount of filler to both left and right labial commissure to encourage a slight upward lift on the corners of the lip. I used a combination of both JUVEDERM Vollure and JUVEDERM Volbella. 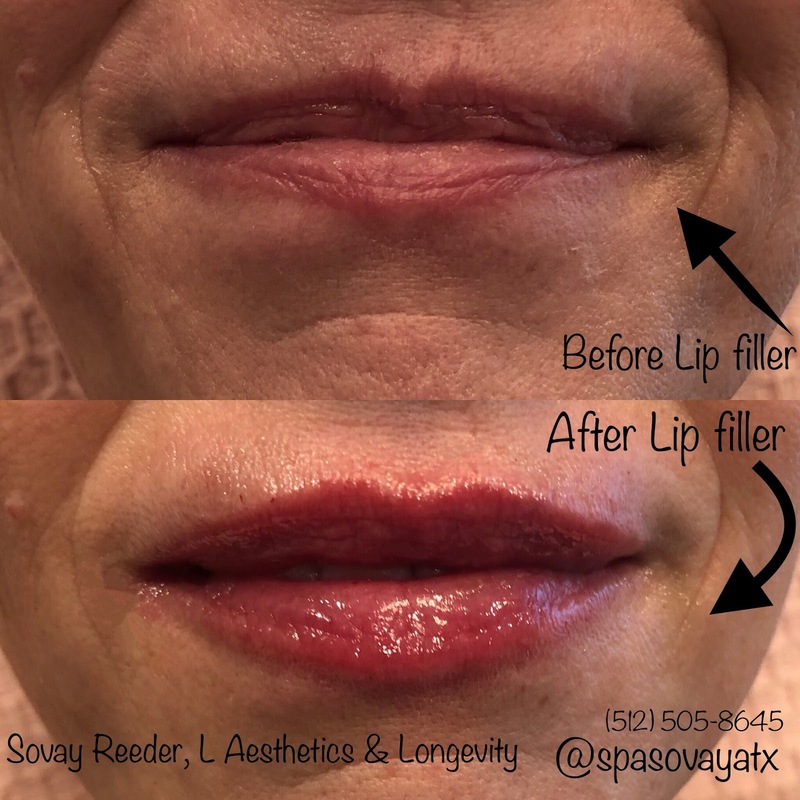 Medical Injector, Sovay Reeder @ Aesthetica Med Spa Austin TX 78746. So this was not an easy before and after case scenario. My patient was simply asking for fuller lips but while we were doing a consultation I noticed an imbalance in her smile as her mouth opened at a slant...it was asymmetric (see before photo). 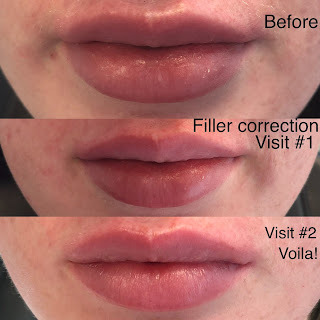 You didn't notice this asymmetry when she was not speaking and her lips were closed so I had to add filler that looked good at a resting state and, more important, addressed her smiling lip asymmetry. 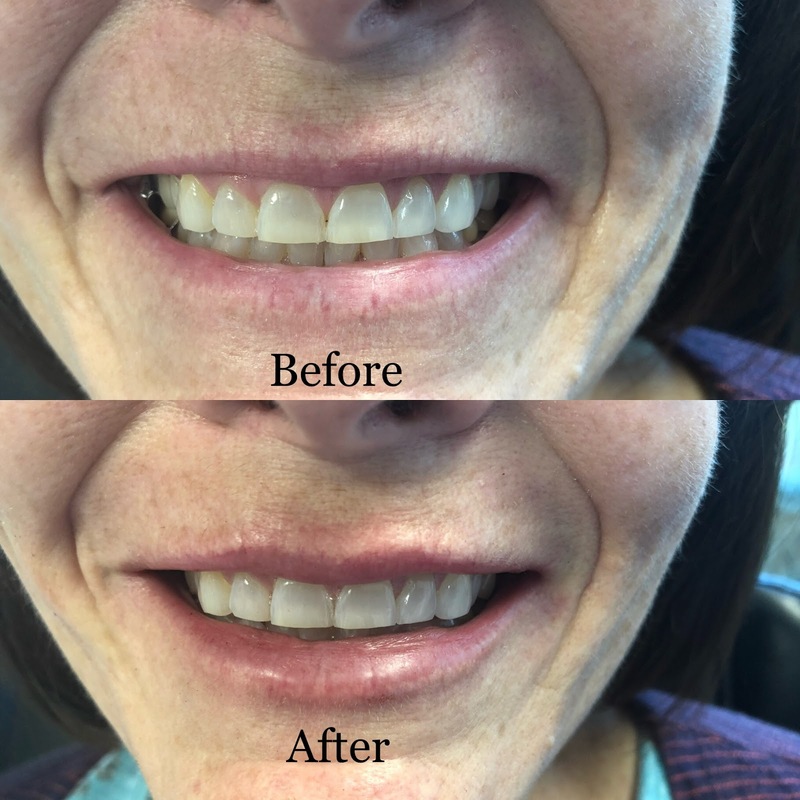 She had beautiful and symmetric teeth and bite and a beautiful face so I wanted to be very careful with the enhancements I made to ensure an even prettier, balanced smile and lips! I started by addressing the muscles below her bottom lip and injected botox to one side only which would help the balance in her lower lip while smiling...so it would not appear crooked. The muscle responsible for this action on this particular patient was the Depressor Labii Inferioris muscle. 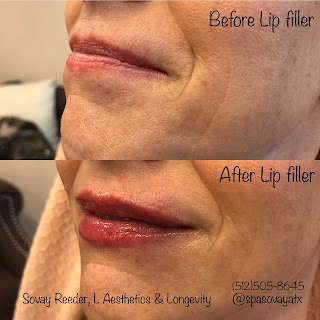 Second, I injected JUVEDERM Ultra XC in her top and bottom lip - the wet/dry border - on the right side and left side leaving out the middle portion on both her bottom and top lip. As you can see in the "before" picture, her middle portion of her top and bottom lip already had more preexisting "pink" area showing. I wanted to accomplish her goal of getting fuller lips while also creating lovely balance and symmetry. Corrective Lip Filler with Medical Injector, Sovay Reeder. 3) both lips were too circular and not heart shaped enough...in other words, we needed to widen the lips from left to right and and some attractive curves to those lips! Ok - so piece of cake, right? I decided to break up my visits with her into 2 separate visits so I could inject a little...wait a week...observe them...revisit and tweak them to perfection on visit #2. During visit #1, I only injected .3 mls of JUVEDERM Ultra XC and on the upper sides, lower sides wet/dry border and the vermillion top only...and again...not that much filler was used. When she returned for visit #2, her lips looked amazing and were already changing shape to a more heart shaped appearance and gorgeous curves on them. I used another .5 ml of JUVEDERM Ultra XC - all on the left and right sides again top and bottom - wet/dry border only to create more "pink" visibility in the lips- bottom and top lip. It's hard to describe how to inject lips because everyone's beauty perspective is so unique but, luckily, the patient and I had exactly the same taste! Labels: Juvederm Vollure. Lip filler Austin. Best filler for lips Austin. Medical injector, Sovay Reeder Austin. Natural lip filler Austin. Med spa Austin Sovay. Best dermal fillers Austin.